Long distance hiking is never a race. Hopefully, everyone is out on the trail to seek their own experiences. Some enjoy photography. Some are recharged by sharing the journey with other hikers. Some prefer to go it alone as much as possible. It’s called “Hike Your Own Hike,” and that diversity is one of the things that make trail life so awesome. A handful of years ago, one woman discovered that her hike involves crushing long distances, with speeds that leave the rest of us in the dust. 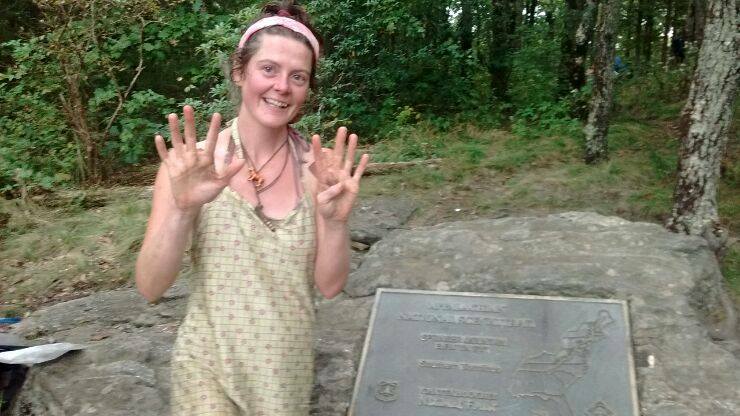 Her trail name is Anish, and in 2013, she set the Self-Supported Fastest Known Time for the PCT, at 60 days 17 hours 12 minutes. That’s for 2650 miles. If you’re doing the math at home, that’s an average of nearly 44 miles per day. “Self-Supported” means just that. Nobody’s carrying your gear for you, so that all you need on your back is water and a few snacks. It’s all up to you…setting up camp, making your food, you name it. And “Fastest Known Time” is also just that. There’s no record book for the long trails. You don’t get a gold medal. Sure, people are impressed, and maybe you get an interview or two. But you do it for you. Hike your own hike. Anish tackled the John Muir Trail (JMT) last year, hoping for a FKT. She didn’t meet her goal. And like many of us who deal with low self-esteem, it haunted her. This year, on August 1st, Anish set out to test herself again. She headed for Mt. Katahdin, Maine, to attempt the Self Supported FKT for the Appalachian Trail, which runs from Katahdin to Springer Mountain, Georgia, a distance of 2185 miles. This her post from today, on the “Anish Hikes” Facebook page. The trail has a way of answering the questions you most need answered, even if you are afraid to ask. Those that have followed me for a while know that I have struggled with self-esteem my entire life. You would think setting the PCT speed record would change that. Yet it only gave the negative thoughts an even more insidious way to demoralize me, especially after I failed to set the JMT record last year. On and on the whispers go. I had to come here, to the AT, where my quest to find myself began 12 years ago and face those voices once and for all, alone. I wrestled not against the trail or external forces, but with them. If it were easy the whispers of inadequacy would continue. Instead I was challenged every single minute. But, every footstep I took was a choice. A choice to face my own perceived inadequacies. Every footstep was a commitment. A commitment to deny that there was any truth to the words of the internal foes. As the miles dwindled into the double digits I became aware that I was crushing more than miles. I was crushing a lifetime of self defeating beliefs. So now, I walk off of Springer Mountain, alone just as I came. My pack, my feet, and my heart are light, unburdened at last. And, I am aware that the end of every journey is simply the beginning of the next and that, far from being behind me, the greatest achievements of my life lie ahead. Congratulations, Anish. I am so very happy for you. On the PCT she was called the ghost. While most were sleeping Anish was hiking.